And then they say that bats use sonar! I guess sonar doesn't exclude non-marine use, but I have never seen it being used out of that context. I see it occasionally. It's more commonly used for aquatic animals, but it's correct for bats as well. Fair enough. I'm not sure whether I preger "Buffalo Bill" or "Bison Bill", though. It's interesting how not-so-distinct the various editions of D&D become when you compare Greyhawk/1e or late 2e/3e. 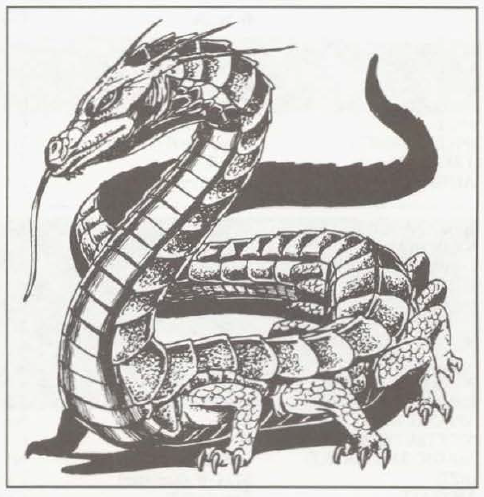 The high level guide for 2e even had tables to calculate ability scores for monsters and the 2e monster books frequently (but not consistently) mention monster STR. It's not as irritating as the "unisex" stuff in Spelljammer, so say the least. Then again, the human brain is frequently called a "computer". 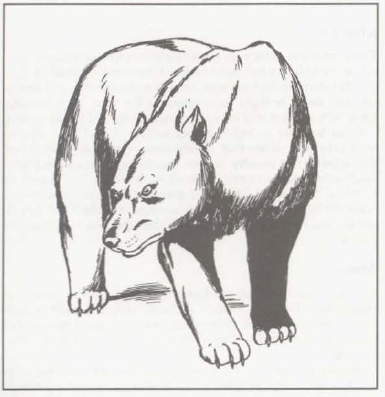 The bear, one of my favourite non-fantastic animals to throw at my players. Here, we get the black, brown cave and polar bear. Of course, bears aren't all that scary because they don't attack humans unless provoked. Exceptions to this rule can be a most unfortunate occurrence. Well, except then the do. All bears have the well-known hug attack (ignoring grappling rules), three regular attacks and continue to fight for a while with negative hit points. All are semi-intelligent, which is smarter than I expected. The brown bear is the smallest and weakest, and doesn't have the rage mode where it fights on despite being dropped to negative hit points. The brown bear and cave bear do, but are ultimately just stronger and more aggressive bears. The cave seems to target adventuring parties specifically. Now, the polar bear is different case. It is the only bear with a swim speed. I guess the other bears are like video game characters: Touch the water surface and you're dead! The polar bear lives in "any cold" climate, which mean that in D&D Land, polar bears eat penguins. Probably a lot of penguins, because the D&D polar is almost five metres tall, which is about twice as tall as the average actual polar bear. Bottom line: I like bears. I didn't realise how monstrous the D&D Land polar bear was, though. I think it's clear even the D&D development team of this era found the grappling rules frustrating. Brown bears wading into streams to fish is a somewhat iconic image from movies and nature shows, but I guess that's wading and not swimming. The swimming ability of polar bears is pretty insane, though,a s I think they're known to swim long distances in water so cold that a human would be looking at minutes before dying of exposure. I don't know if this is supported in the rules but I think it'd be reasonable to state that non-polar Bears can probably swim, but have to make an ability-check equivalent to do so: essentially, they swim like (most) PCs, who don't have a set Swim speed listed. The Polar Bear swims enough that it can skip any checks and moves at a steady speed. :if it's lsited they perform like PC" is true for most monsters, although some common sense might be needed. The size does seem a little ridiculous, though. Do you think maybe the 5m height was calculated not as "at the shoulder" but "standing on its hind legs"? In the latter case that's a somewhat more reasonable height. That's a pretty good rule: Not check for natural swimmers. The again, this is AD&D 2e, so why not introduce exception-based swim checks to prevent random death? A large polar bear is apparently 2.5 to 3 m long (says Wikipedia), so five metres is still huge. Not Dire Polar Bear of Death huge, though. The entry also comments on the "common belief that bats are blind". Is that really so common? It was stated authoritatively to be the case in one letter to Dragon magazine, somewhat before this was published. The behir is a little bit like a blue dragon, but lacks the wings and is multi-legged instead. It's also less intelligent. I would probably even reduce it to animal-level or semi-intelligent; not every fantastic creature needs to be sentient. The illustration is nice and reflects what I associated with early AD&D 2e. It makes the behir look a little small, though. Apart from being a classic D&D monster, the behir isn't all that special, to be honest. It can throw Lighting Bolts and can be turned into "highly ornate" scale mail armour. There are a couple a things I didn't remember, though, like behirs and dragons never co-existing in the same area or behir blood being used as ink for scrolls. Bottom line: The behir is a solid monster if you need a naturally evil reptile with few motivations other than wanting to eat the player characters. HR3: Celtcs used the behir for two Celtic variants, with some removed powers on some. I feel like this is a de-facto "Dragon lite" in default D&D. It's similar, but not nearly as big of a deal due to being more animal-ish without spellcasting, flight, or the tendency to be 'important' to the setting like Dragons do. (Expansion of the last point: I feel like in many settings a Dragon is a big deal. They're rarely just monsters, they're almost always bosses or similar. At the least, characters with names and basic histories. Then there's settings like Dragonlance where they're even more plot-centric.